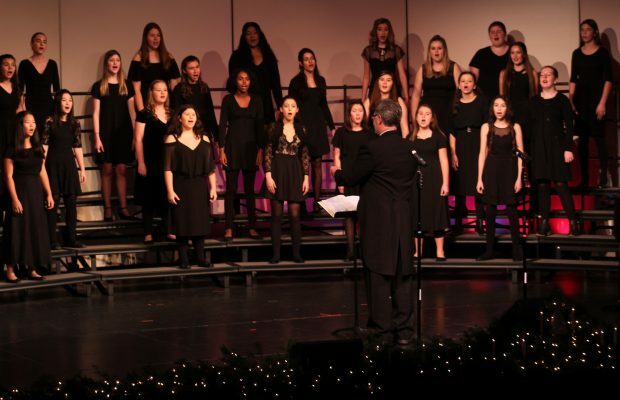 The NPHS winter choir concert made its first performance in the PAC on Dec. 20. A two and a half hour performance of winter holiday songs successfully set the audience in a holiday spirit. Haley Ligsay, senior, has been an active member of choir since third grade. This was her 35th high school choir concert. “Tonight’s performance was spectacular, we had a very energetic audience and each choir fed off their enthusiasm, which truly enhanced our many songs,” Ligsay said. Students have been working hard to prepare for the winter concert since the beginning of the school year and had to put in an extra amount of time and effort due to the fires. Pooja Bhatnagar, senior, has been a member of choir since freshman year and this is her tenth concert in NPHS. For many people, the annual winter concert is one of their favorites because of the joy and memories it brings before the holiday. “I think the winter concert has this really special coming together vibe, especially after all the trauma that Thousand Oaks has been through. We sing some of the same songs every year and so people come back to hear those songs even after their kids have graduated and I think it really brings to community together,” Bhatnagar said. Willa Stonecipher, senior, also believes the winter concert is one of the most spirited to watch. Stonecipher is a soprano in chamber and concert choir. “It’s one of our most fun concerts other than year end and it gets you in the holiday spirit. It hypes you up and it’s a fun time,” Stonecipher said. Even though this would be the last winter concert for many senior choir students, they still want to enjoy the last few opportunities of being on stage with their friends.